Theodore Roosevelt was always fascinated with nature and animals. His legacy can still be seen today through specimens collected for museums. That love of animals is something he passed down to his six children who had among them snakes, dogs, cats, a badger, birds, a bear, guinea pigs, ponies, a hyena and five dogs! 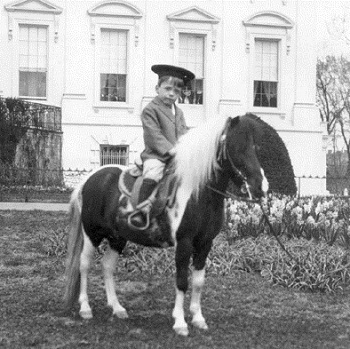 When Roosevelt’s son Archie got the measles, his brother Quentin thought a visit from the family pony might cheer Archie up. Quentin put the animal on the White House elevator and brought him to Archie’s upstairs room. Roosevelt had to hold back laughter as he scolded Quentin. But, Quentin’s animal adventures didn’t end there. Once he borrowed a bunch of snakes from a pet store. Running to show his father, Quentin interrupted an important meeting and dropped the snakes all over his father’s desk. Alice, Roosevelt’s 17-year-old daughter (and one of the prettiest girls in Washington), had a pet snake as well named Emily Spinach. She took great joy in hiding the snake in a covered dinner plate during large White House banquets, and waiting for the shriek from guests when Emily appeared. Roosevelt’s bull terrier, Pete was a beloved member of the First Family but was not a hit with visitors. Pete once attacked the French ambassador. After much commotion he was found to be uninjured but the same couldn’t be said for his pants. Pete had shredded one entire pant-leg. Theodore Roosevelt had a charisma about him that was described by one as “After you met Roosevelt, you needed to wring the personality out of your clothes”. 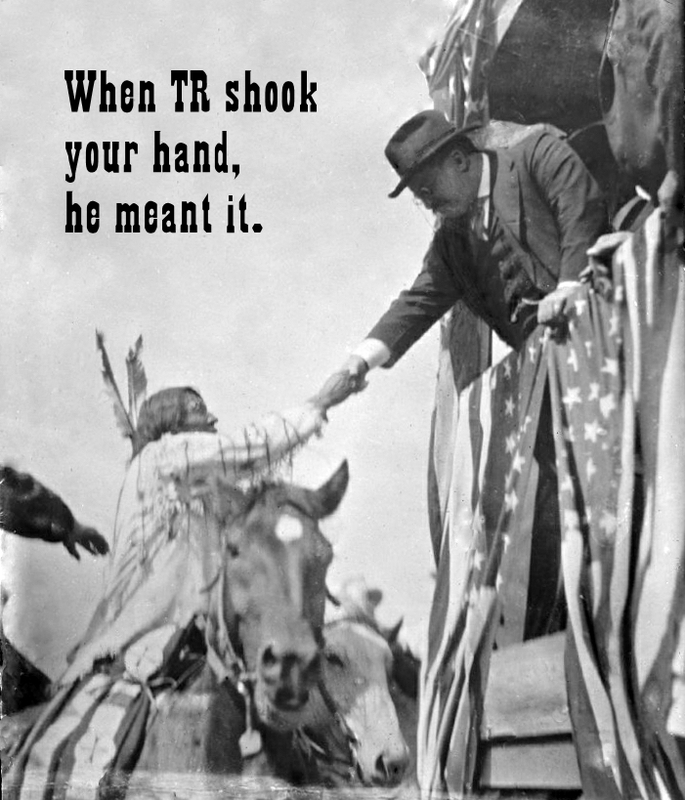 Because of public demand to meet the great TR, on New Years Day, 1907, The Roosevelt’s held an open house where the public could shake hands with the President. By the end of the day, Roosevelt had shaken the hands of 8,510 people, setting a new Guinness World record. That record would hold until July of 1977 – over 70 years. 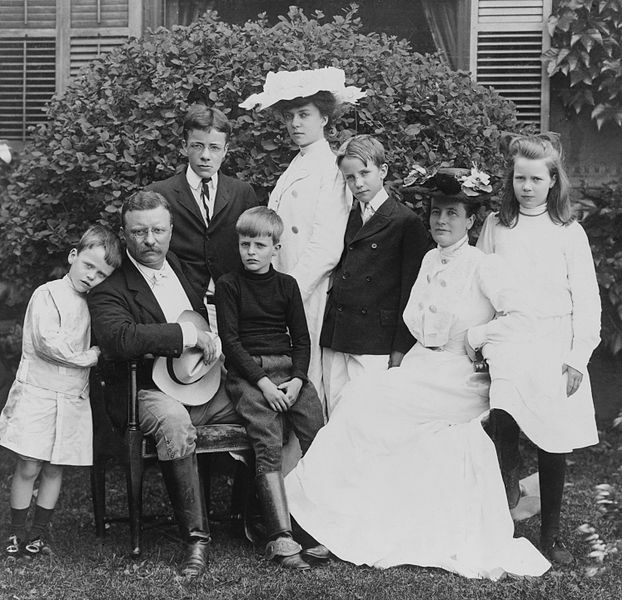 Born on October 27, 1858 in New York City, Roosevelt grew up in a world of wealth and privilege. Young Theodore however was found to be afflicted at a young age with Asthma as well as other illnesses. Because of his health, Roosevelt spent much of his childhood years bed ridden or at least confined to his home. He often slept propped up in bed or slouching in a chair during much of his early years. Despite his illnesses, he was hyperactive and often mischievous. During severe bout of asthma attacks, his family would feed him strong coffee, thought in the day to be a proper treatment. 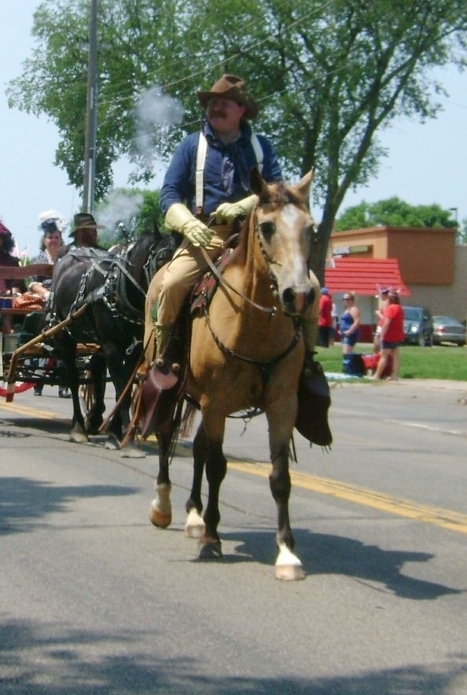 His father would also would take him by carriage out of the city, so he could get fresh air. It was here that TR developed a love of nature. Some suggest this was partially psychological, as it gave him a chance to be alone with his father and also was the place where he could breath freely. The times that young “Teedie” was healthy, he would explore the woods and trails and observe bugs, birds and animals. His lifelong interest in zoology was formed at age seven upon seeing a dead seal at a local market. After obtaining the seal’s head, the young Roosevelt and two of his cousins formed what they called the “Roosevelt Museum of Natural History”. Learning the rudiments of taxidermy from John Bell, (a famous taxidermist and colleague of wildlife artist John James Audubon) he filled his makeshift museum with animals that he killed or caught, studied, and prepared for display. At age nine, he codified his observation of insects with a paper titled “The Natural History of Insects”. At age 12, he donated some of them – a dozen mice, a bat, a turtle, four birds’ eggs and the skull of a red squirrel – to the American Museum of Natural History, founded by his father. Eleven years later, he presented 622 carefully preserved bird skins to the Smithsonian. Theodore Roosevelt was Assistant Secretary of the Navy, reporting to the Secretary of the Navy when the Spanish American war was declared. In his role. he had often overstepped his role and took command of the Navy because his boss, John Davis Long was Ill and unable to serve his duties. Roosevelt had a very different perspective on preparedness and pushed his beliefs on Long, who had a more reserved approach. This led to Long creating systems to try and control Roosevelt from broaching his authority. As part of a display of the United States support of the Cuban people who were at war with Spain, the United States sent the U.S.S. Maine, an armored cruiser battleship to sit on display in support of the Cuban people. The sinking of the U.S.S. Maine in Havana Harbor on February 15 1898 ultimately lead to the declaration of war and a change in personal direction for Roosevelt. He and his friend Leonard Wood attempted to enlist in the regular army but were turned away. Then Congress decided to assemble a volunteer unit made up of cowboys, sharp shooters and the like from Arizona, New Mexico, Oklahoma and Texas. Later, the number was increased to allow a few of the upper crust from the east who also wanted to fight. Roosevelt was offered leadership of one the on the Calvary Units, but declined because he felt (and knew) his friend Wood had the experience necessary to lead the men to increase their chance for success. Roosevelt knew that while he had led many people in different roles in his life (Civil service commission, Rancher, Police Commissioner) he had not led someone into war, and that he would better serve his men by having someone in charge with experience. Ultimately, Roosevelt’s example on the field, leading the charge first up Kettle Hill and then San Juan Hill gave his men the ideal of leadership. But Roosevelt’s decision to first learn from Wood probably saved many, many lives. In my line of work, you need to read a great deal of books about Theodore Roosevelt. My current undertaking is called Lion in the White House, a life of Theodore Roosevelt by Aida D. Donald. Called a “short Biography” this book is a well written overview of TR. Filled with images as well as interesting stories, this is a great way to get “your feet wet” about the man who was called “the Lion” by his children. With a man as complex as Roosevelt, I recommend that you start out by reading a book like this one, and then focus in on the parts of TR’s life that interest you. I have many, many books that outline the history of Roosevelt in detail and many are very good. I love to shop antique stores and find old volumes that have been out of print that may give me added insights into the complex man many know as “Teddy”. This has led me to books on his daughter Alice, herself an interesting character and on Edith, his wife, who was as important in his career (as any man with a good wife knows). I recently found a book focused on TR at Oyster Bay at his home which details his family life, a great find and a perfect glimpse into the man when he was away from the White House. I spend a great deal of time on the internet as well and find that many of the stories about TR have been frankly poorly copied or altogether incorrect. If you read a fact stated on my web site, I have at least three volumes of data to support the statement. However, there is an important statement I learned long ago “History is lies agreed upon”. So while I have supporting evidence, I always take into account that the evidence is only as good as the person giving it. Assemblyman, Cowboy, Policeman, Soldier, Navy man, Vice President, President. No matter how you know of the name Theodore Roosevelt, there is a complex story attached about the way he lived his life. That’s why portraying him can be so hard. There are so many facets to the man that you almost have to “take a sliver in time” and try to get that sliver just right and then move on to the next. When I first discovered my resemblance to the man, it was by accident. I was appearing in a play and a photographer had taken a photo from below the stage, looking up at me. In the photo I had my reading glasses on, and I thought I sort of resembled the 26th President. At the time, I was consulting to River Junction Trade Company and I had Jim Boeke make me up a rough rider hat, just to see how I looked. The next week, I went to our monthly poker game in my new hat and glasses and you could have heard a pin drop. My persona as the man himself was born. Many years of listening to Roosevelt’s voice and pacing (Thank’s Thomas Edison) and I was able to recreate the man as best a mortal can. I still don’t have Roosevelt’s photographic memory; can’t speak latin; slaughter the name of birds and fauna and; don’t know a spec of Jiu jitsu. That doesn’t mean I don’t do my best each day to recreate the man! He was a complex man, and just being able to perform as him is an honor. Could we lose our National Parks and Monuments? National Park Foundation The National Park Foundation is the official charity of the United States’ 59 national parks. The National Cowboy Museum Roosevelt was a charter member of the great hall here!